Earlier this year Ascot Care were entered into the North East Business Awards for Company of the Year, which was judged throughout January and February. Ascot Care were proud to be nominated and went on to be successfully shortlisted out of a vast and highly skilled group of entrants. We feel privileged to have been in the finals of such an award, as the North East Business Awards are the biggest and best of their kind. 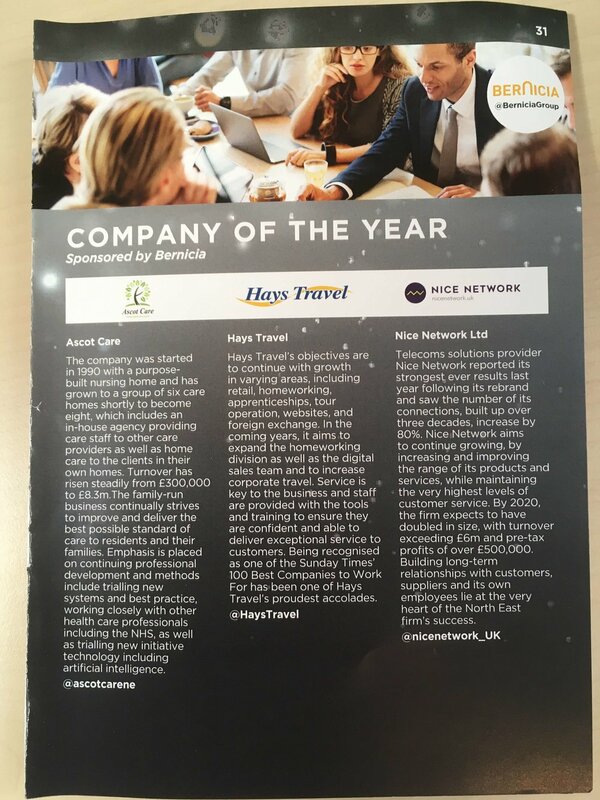 Over 2000 people attended the regional awards this year and we couldn’t feel prouder to make it to the finals after attending a fabulous awards ceremony held at Ramside Hall Hotel earlier in March. “Its been a fantastic evening, we are extremely proud that Ascot Care has been recognised for the high standards of care in our care homes, we are extremely proud of the staff at Ascot Care and feel this is great recognition for our staff and their efforts in delivering such high care standards”. The awards are held in association with the North East Chamber of Commerce and give the chance to showcase businesses of all areas, whether large or small, highlighting success, innovation, and show that the North East is an inspiring place to live, work and do business. Ascot Care feel honoured to have been part of this and would like to thank the organisers of this event along with our own team, for making it such a successful occasion.